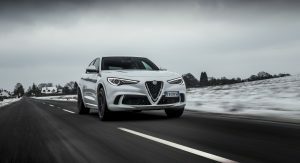 Alfa Romeo has announced the pricing details of the range-topping Stelvio Quadrifoglio, the 505hp version of Giulia’s SUV sibling, in the UK. 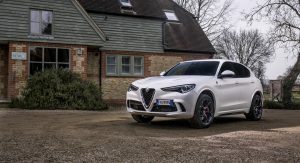 It was never going to be cheap but at £69,500 OTR, the new Alfa Romeo Stelvio Quadrifoglio matches the prices of the Porsche Macan Turbo Performance Pack (£69,505) and of the Mercedes-AMG GLC63 (£69,820). 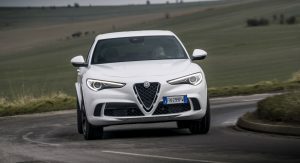 By pricing their high-performance SUV that close to its established German rivals, Alfa Romeo proves their faith into their product but it’ll take some serious convincing for customers to put down their signatures for the top-dog Stelvio. 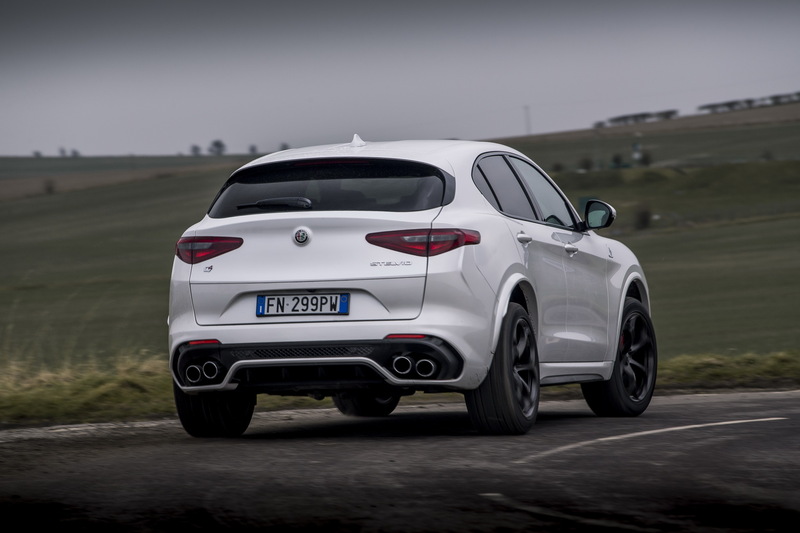 The new Alfa Romeo Stelvio Quadrifoglio certainly has both Germans covered, in terms of horsepower: its twin-turbo 2.9-liter V6 produces 505hp and 443lb-ft (Macan Turbo Performance: 434hp/442lb-ft, GLC63: 469hp/479lb-ft). You could argue that the Mercedes-AMG GLC63 S (503hp/516lb-ft) is the real rival of the Stelvio Quadrifoglio, and you would have a fair point but it’s still more expensive than the Italian newcomer, starting at £75,670. 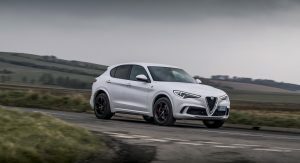 The Stelvio Quadrifoglio can hit 62mph from a standstill in 3.8 seconds; keep your right foot planted for long enough and it’ll reach 176mph flat out. And speaking of numbers, the Alfa set a very impressive lap time of 7min 51.7sec at the Nurburgring. 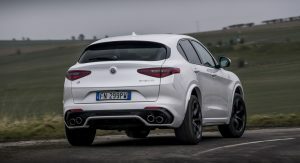 The standard specification of the Alfa Romeo Stelvio Quadrifoglio includes 20-inch alloy wheels tucked under model-specific wheel arches, bi-xenon headlights with LED DRLs, leather dashboard and door cards, leather and Alcantara seats, carbon fiber trim, an 8.8-inch infotainment system with Apple Car Play and Android Auto. 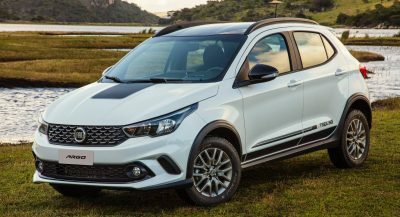 The range of standard safety systems includes Autonomous Emergency Braking, Lane Departure Warning, Forward Collision Warning and more. 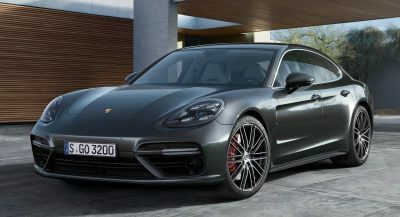 The chassis features an adaptive suspension, rear-biased all-wheel drive and active torque vectoring. Alfa Romeo UK says that the first customer cars will arrive in the country this September. In no way, shape, or form is it in the top 5 in the USA. Alfa is trash in the United States. As you would say, “Get informed!!”. 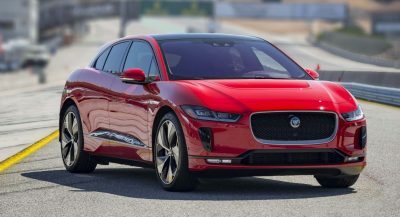 EDIT: UK sales for 2017 – 4,997 cars, market share 0.20%. less cars sold = smaller chance for reliability problems…..
Not true if the Cars are unreliable. Which is the claim. Unreliability is either a design fault , a supplier problem, or both. If it is a design fault then all the cars have a likely hood of a failure irrespective of the number built. if it is a suppler problem than several different types of failure may be apparent. Considering how few OEMs are out there, if it is a supplier fault, then many car producers will have similar problems. Just look at Takata airbags and the problem that OEM has caused across the automotive industry. 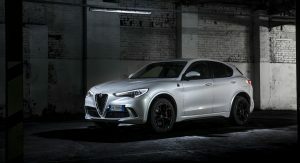 GLC 63 looks way better but on the othr hand people need to be more supportive for alfa. Yeah, I’ll take the GLC63 because I actually want to drive the vehicle I purchased, not a 500L loaner car. Yawn. Go back to driving your “Nazi” machine manufactured by a known slave user. And it will be a £20,000 trade-in after 24 months no doubt. It’s one of Alfa’s biggest issues in the UK. The residuals are shocking which makes finance and leasing stupidly expensive. A BMW M3 is £200/month cheaper than a Quadrifoglio because Alfa won’t stand behind future values and the trade thinks that no one will want one pre-owned unless its cheap. I don’t think Alfa understand the U.K. market. 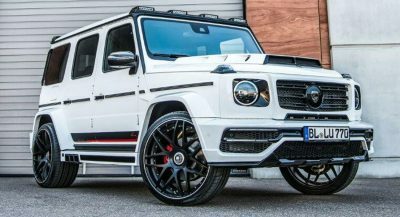 Why they think they can price their car, no matter how good it is, at the same price level as the very well established German brand names who already have a trusted network and brand loyalty in the UK. No one will buy the Alfa Stelvio QV for the same amount you can get for a Porsche Macan Turbo PP or Merc-AMG GLC Coupe 63s, not in the U.K. I don’t think Alfa know what market they are operating in. You got to start off with a good product, which they have, and also, Value Proposition, i.e., incentives, free added options, lower price to competitors etc. They’d be lucky to sell even one of that car in the U.K.